Many get ‘hooked’ by a Red Admiral butterfly. Their high school Biology teacher (I was one, once) solemnly declares that soon, very soon species will begin to lose ground and lose habitat. She, dogmatically repeating the mantra pushed by some, is resigned to the loss of all kinds of native species, butterflies, until the time that only Cabbage whites, Painted ladies, Eastern tiger swallowtails and the lookalike skippers are all that’s left. Me? That’s hogwash. I cannot forget when I taught at the John Adams High School Annex in South Ozone Park, New York City. My classroom was on the 5th floor of an elementary school. The classroom ceilings were some 18 feet high or so, so the 5th floor was as high as most 9-story buildings. We faced the west in that room. Some 19 or 20- miles away, we might have seen the Empire State Building and the Twin Towers of the World Trade Center. Huh? We couldn’t see them, for there was a permanent blanket of smog preventing us from seeing Manhattan and those fable skyscrapers. New York’s electricity provider, Consolidated Edison, announced that they would be installing new “scrubbers” in their chimneys, to combat the smog. The federal government made all car makers install catalytic converters. Scrubbers and converters, token solutions. Yeah, yeah, yeah . . . the same old, same old. We were New Yorkers, those kids and I, and we didn’t buy it, zero. One summer later, and I returned to that room that I loved, awaiting those kids from every corner of the world, those big, strong, street tough kids. I looked out that wall of windows, to the eastern half of Manhattan and Oh My Goodness!! there they were, I was seeing the Empire State Building and the Twin Towers. That moment jarred me. Really. It can be done. Progress can be made. Slow as a snail New York City and bureaucratic Con Edison can work together and clean the air of that enormous city. Mamma Mia! Lesson? Don’t buy the doomsayers. Keep your mind open to change and . . . For sure, that’s why I never bought the ‘Global warming/Al Gore’ pitch. Nope. 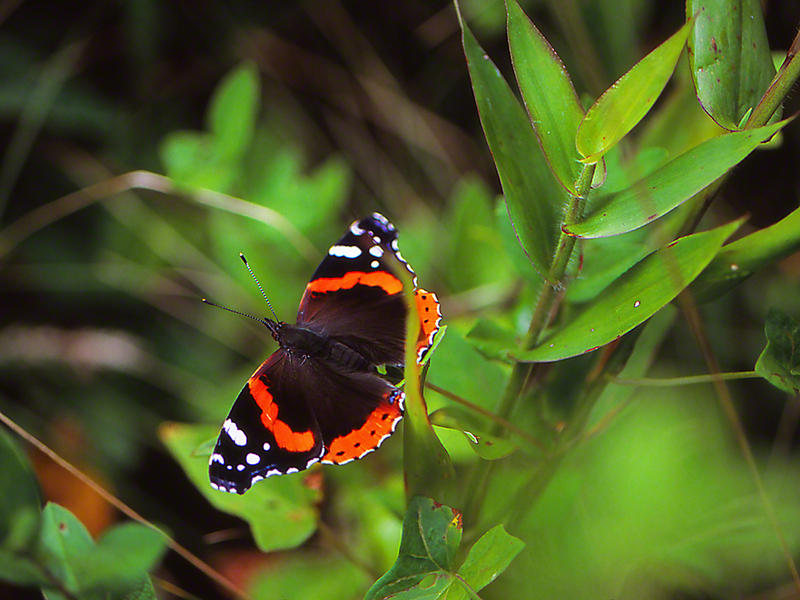 When jaded Nature lovers visit the State Parks or Wildlife Management Areas or such, the chance appearance of a Red Admiral, like this one, can startle. Wwwwhat was that? No Tony, there has not been a mass extinction of butterflies and more. Admire this gorgeous butterfly before it once again takes off to ??? Hey, if this is out there, what other Holy Cows? are there flying in a place like this, Raccoon Creek State Park in southwestern Pennsylvania. The several hundred times I was there flushed out a slew of OMG!’s including Goatweed leafwing, Red-barred sulphur, Harvester, White M hairstreak, Meadow fritillary, Pipevine swallowtail, Compton tortoiseshell, Milbert’s tortoiseshell and a Bronze copper butterfly. The perfect Red Admiral butterfly cannot be readily forgotten and jumps the curiosity quotient in one’s cognitive whatchamacallit. You’ve just gotta’ get back out there, away from that 97% that cobwebs you up, and find that rare, incredible, drop-dead-unbelieveable butterfly you had no idea was . . .
Change Your Place, Change . . .
700 miles. That’s how far I moved last year. Family and friends know how much I enjoy this pursuit of butterflies, and they’ve heard of why I do what I do. It’s 55 degrees F in my former home now, and its’s a whopping 80 degrees F in middle Georgia, the Piedmont region. 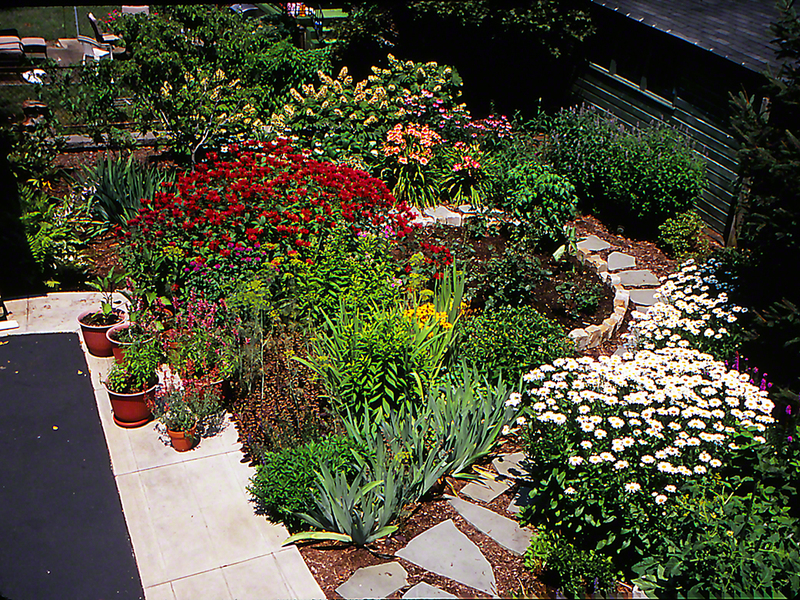 Back there, in Pittsburgh, the Monarch butterflies were singletons, and you might see 3-5 any given year. They would be seen until mid-September each of those 27 years, and October might shake out a stray Cabbage White butterfly, maybe. Today! Today in my 1-year old natives garden, I went out to give Petra some exercise, and there in Bed #2 of my garden, together on a group of giant Tithonia (Mexican sunflower plants) . . . were Five (5) Monarchs, males and females at the Tithonias, the nectar bar for thousands of butterflies this year. Five! I’ve never seen such a grouping together, ever. I’ve driven down here, beginning back in 2015, and butterflies fly well into November. I L-U-V it! Change your place, many Moms say, and you Change . . .
All those years of enjoying the antics of Pearl Crescents, and that handful of Phaon Crescents that introduced themselves to me in Mississippi, Georgia and Florida didn’t prepare me for this, my first meet-up with a Vesta Crescent. She was taking a break in the National Butterfly Center, in Mission, Texas. Phaon? Pearl? a gentle mix of closely related Crescents? I was more than pleased to much later discover that she was a Vesta Crescent. Places that Vesta butterflies call home are in Texas, Oklahoma and Mexico. Another new butterfly for Jeff, and ongoing acknowledgement that the Cr-ator has been very busy. I have read this often, and attempt to emulate it in my own life, whether gardening to attract winged beauties, or with family and friends, in my spiritual life, and in the field, as I attempt to capture ever more beautiful images of butterflies, darners, wildflowers, whatever . . . .
To laugh often and to love much . . .
To appreciate beauty; to give of one’s self . . .
a redeemed social condition . . .